Anyone can book a room at a chain hotel. But sometimes you just have to get a little adventurous and go for something out of the ordinary. That is where the following unique hotels come into play. Click on any of the Titles to go to their homepage. 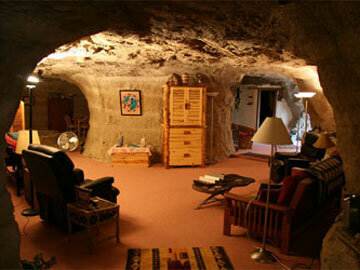 Carved out of sandstone in Farmington New Mexico by Father and Son, the 1,650 sq ft one bedroom cave comes with a kitchen, washer and dryer and hot and cold running water. You have to check in at the owners home and then be driven to the cave so as not to get lost. Don’t bring much luggage because just getting in and back out of the cave is an adventure. Steep steps and ladders make it a place you really have to want to stay at. One of the pricier options but also one of the more unique. With 24 suites and a luxury apartment sitting 40 feet below the surface guests have the use of a spa, gourmet dining, fitness center an library. 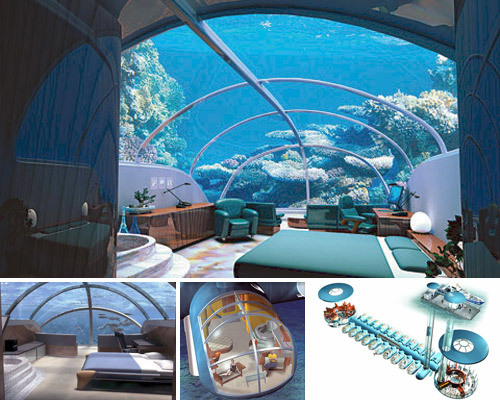 Your own personal Triton submersible, diving and exploring the island does not come cheap though. 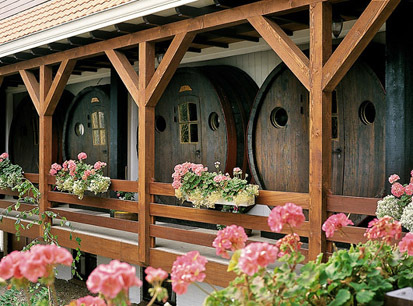 At $15,000 per week per person save a few bucks because specialty wines and liquors are extra. Located in Stavoren Netherlands this hotel sits in a harbor city that offers aquatic sports, hiking and biking. The hotel has modern rooms with a scenic view and a few special rooms for those wanting something different. Converted from Wine Casks each of the four special rooms offers a sitting room with television, radio, shower and bathroom. On August 4, 1892 this home in Fall River Ma became the site of one of the most famous and gruesome murders in US History at that time. Although acquitted Lizzie Borden is believed to have killed both her father and stepmother with an axe. 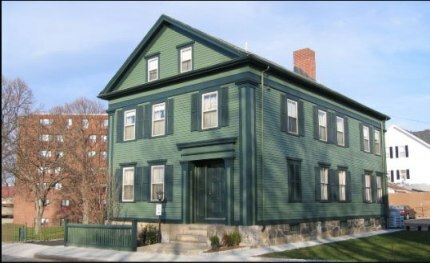 After the trial Lizzie moved out of the house and remained in Fall River, the house has been privately owned since. And now you can stay in the home which some say is haunted. 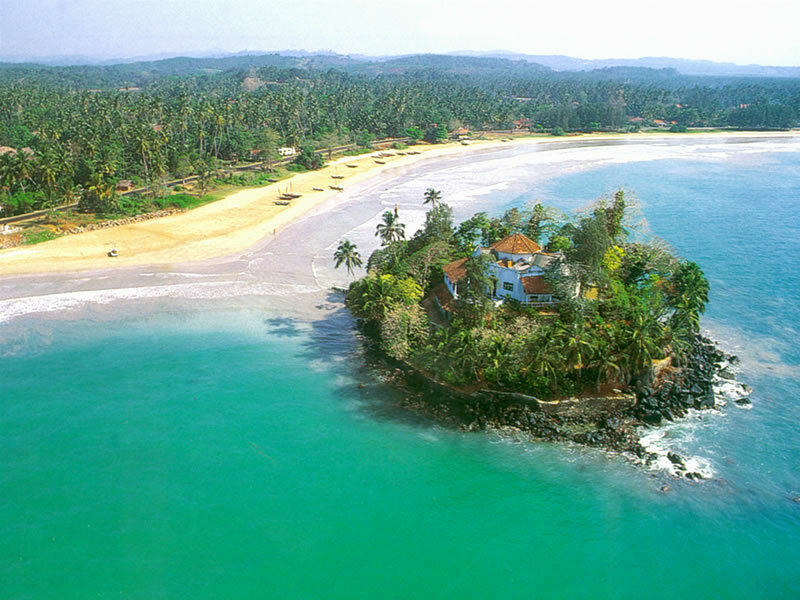 Sri Lankas only private island is only 2 1/2 acres but has all the amenities needed. With 5 en-suite bedrooms, spacious living areas, balconies, verandas, tropical gardens and an infinity pool, this island has everything you need to get away from it all and still have it all. Originally built in the 1920’s the island has welcomed Kings, Queens, Presidents and Prime Ministers. But bring shorts or roll up the pants legs because you have to wade through the surf to get there. 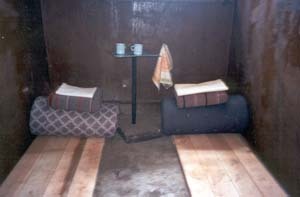 Sparse dirty bunks, no television, no radio and a hotel staff that tells you what to do and makes you do chores for punishment. That is what awaits you in the former military prison used during the reign of the Soviet Union. A working prison until 1997 you can only stay one night and that is after signing an agreement as to what awaits you during your stay. Several prisoners died during their short stay at the prison and numerous guests have witnessed eerie happenings and apparitions. 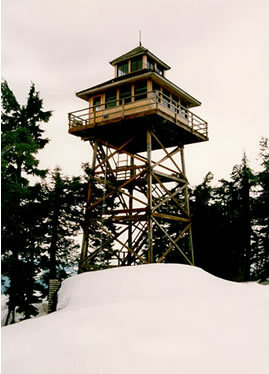 Operated by the US Forestry Service Warner Mountain Lookout in the Willamette National Forest of Oregon is one of several fire watch towers that can be rented out. With excellent views of the forest this 14ft by 14 ft tower has a propane stove, table, chairs and even a 2 way radio for emergencies. You do have to bring your own food and water. And no smoking allowed in the tower. After all it is a fire lookout tower. After going up and down those steps a few times for a smoke you may not want a smoke anyway. If staying during the winter you are warned that traveling over 10 miles of snow to get in and out could take up to a day and experience in cross country skiing or snowshoes is highly recommended. 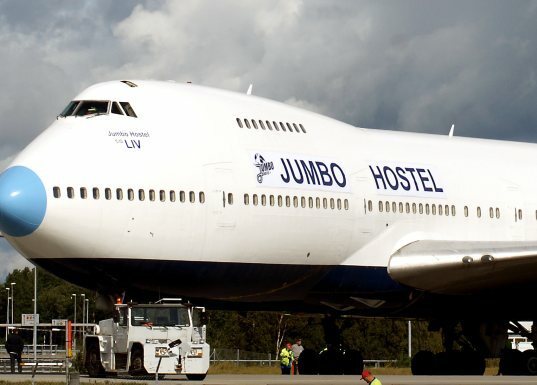 Sitting off to the side of the tarmac at Arlanda Airport in Stockholm Sweden is a 747-200 Jumbo Jet converted into a hostel. Complete with bar this hostel offers travelers an inexpensive option to other accommodations in the area. With an on board cafe and 76 beds the hostel offers overnight accommodations or just a place to sit and relax for awhile. 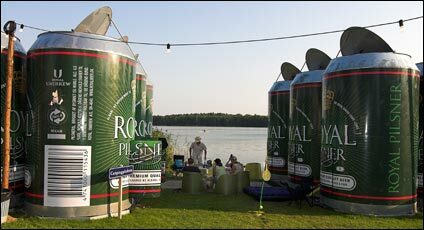 Open only one month out of the year during the Skanderborg Denmark Music and Food festival, the Can Sleep Hotel offers a 7 ft diameter 12.3 ft tall beer can room for two. Furnished with tables, chairs and shelves it gives the party goer easy access to all the festival activities. But act quick because the Can Sleep sells out quickly every year and unfortunately does not come with beer. 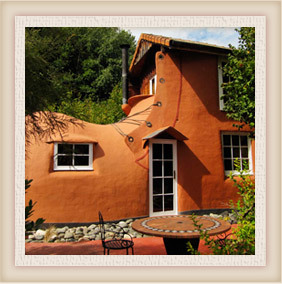 Located on the Ruby Coast in new Zealand, The Boot offers a 2 story cottage made for two people. Enjoy the kitchenette, sitting area and open fireplace downstairs then take the spiral staircase upstairs to the bedroom equipped with a queen sized bed. A manicured courtyard outside and breakfast delivered daily makes this a nice getaway and a place that although guys may not appreciate will score points with your lady. After all how many times do you get to stay in a boot? Just don’t refer to her as the old lady that lived in the shoe. I think the tiny island in Sri Lanka is my favorite. 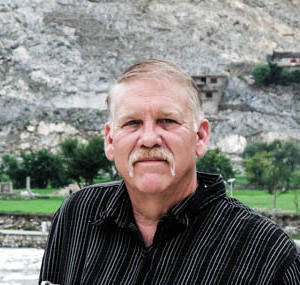 Enjoyed this post, thanks for sharing! Have you stayed at any of these places? 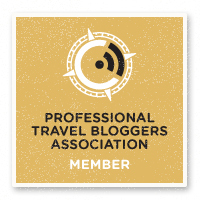 Haven’t stayed at any of these yet but Taprobane Island is on my list. I think I will leave the prisons and boots to others. I can confirm that Warner Mountain Lookout is a tad risky to rent out during the winter months. My father and his friend snowshoed up to the lookout, got caught in a blizzard, and ended up needing to radio for a rescue from the Forest Service. Don’t go up unless you’re absolutely positive you’ll be able to get down. Thanks for the comment. It is a little remote especially in winter like you said. Thanks for stopping by, There are lots of strange and wacky places out there.